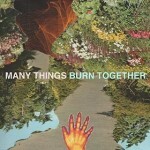 Share the post "Album review: MANY THINGS – Burn Together"
I first heard Many Things when they supported The Polyphonic Spree last year and they bowled me over with their quirky pop and ear for a good melody. The band consist of Michael Tomlinson (vocals/guitar), Macks Faulkron (drums) and Gabi Woo (keys) and they have released a series of singles in the lead up to this, their debut album. The album starts with the electronic pop and effects strewn ‘Holy Fire’, something they return to on ‘Paranoid People Meet In The Middle’. The latter has an amazing use of vocals and effects, one for the headphones that’s for sure. ‘Alpha Romeo’ is a classy pop rocker, with a hook filled chorus. ‘Heaven’ is a synth led pop tune, for those old school types like me OMD come to mind on the synth arrangements. ‘Dear One’ with a steady drum beat and waves of piano/synths is another tune you will be humming after just a couple of plays. ‘Chains’ and the title track highlight the vocals of Michael Tomlinson, backed by the keys/synths of Gabi Woo. This entry was posted in ALBUM REVIEWS, ALBUM REVIEWS (Mobile), All Posts and tagged album, Burn Together, electronic, Many Things, pop, review. Bookmark the permalink.